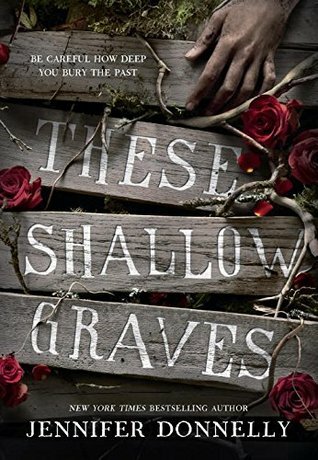 I’m not generally huge into period pieces, I’m more of a modern or futuristic gal, but the premise behind These Shallow Graves caught my attention and I do love a good mystery. I’m so glad I requested this galley, and thanks again to Random House for being awesome. Right away I adored the main character, Josephine (Jo). There were so many moments where I was actually cheering her on. A lot of things written in this book make me weep for woman kind, and I can’t believe the things we had to put up with way back when, and Jennifer Donnelly captures that well. With her MC Jo she’s able to break down the stereotype that a woman can’t be a journalist or hold a real job. That the only thing she’s good for is to marry and squeeze out some children. Jo still plans for this to be her future, but we see through her journey that it’s definitely not the future she wants anymore. She wants to use her brain, be a real journalist, and maybe even marry for love and not money. Then there’s the mystery. Jo’s father dies in an unsettling way, and since her family seems content to accept his death as a suicide, it’s up to her to find the truth. Majority of the book read like a game of Clue and I loved that. Was it the butler with the revolver in the study? Was it the maid with the.. well regardless we know it was a gunshot and that he was indeed in his study, or office, so I guess those two clues were actual facts. But still. It was a large house with a good amount of staff, and watching Jo and her partner in crime, Eddie, narrow down who it could or couldn’t be was just a lot of fun for me. The problems I had with this book were that it was just too long for my taste. There was a lot of info to sift through and I felt like unnecessary things could’ve been taken out to lighten the page load and keep the interest alive. Towards the middle I started to get a little bored and at one point I didn’t care about the mystery anymore I only wanted more romance. However, toward the end when things started to really get moving I was back on the horse and all about the mystery once again. The end wasn’t anything too terribly shocking, but it wasn’t dissatisfying either. Jennifer wraps everything up nicely as far as the mystery, but leaves the fate of Jo’s love life a little open ended for your own imagination to fill in the details. I gave this book a 4 star rating because the info dumping was a little much but I really did love Jo. 8 times out of 10 I don’t love the female lead characters more than the other characters, but this time I did. She was my favorite among the bunch and I admire the choices she made. If you like mysteries and piecing together a huge heaping pile of clues, then These Shallow Graves is for you. Pick it up on October 27th. Queen of Shadows Blog Tour: Blueberry Tarts + giveaway!